Andrew Guyton has built a number of instruments for Queen guitarist Brian May over the years, and the double has his full approval: in fact Brian has just taken delivery of his own example. Here's the full interview with Andrew, sections of which appear in the Summer issue of Guitarist. "So I emailed Brian to see if it was OK, and he said yes in principle but that he should have the first one, which is fair enough. So he's had the first one, and the other sale has since fallen through (laughs)." 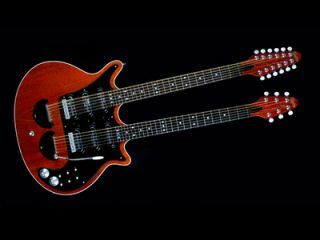 How close is it in construction to the original Red Special? "It's exactly the same. It has the acoustic pocket, a mahogany neck, oak fingerboard, and pine blockboard." How about the 12-string bridge? "The hardware and bridges are all made from scratch. A local engineer made them. They're basically the same as the six-string, but the roller [saddles] each have a two-string slot. I have had some made that have two rollers within a single bridge block that can be independently adjusted, but they've not been entirely successful. "Intonation-wise the whole thing is a bit of a compromise, but it's a piece of cake to tune. With the nut all you're worried about is string spacing rather than string depth, and the zero fret is dead easy, really." How long did it take you to put it together? (Thinks) "I have no idea…I didn't keep a record. At least twice as long as the six-string, but this one has been in construction for years: it was hanging up in the workshop for 18 months having things done to it. I mean, from taking the lacquered body and necks it took three weeks of 12-hour days to assemble it, do the pickguards, the fretting, all that." "To start with it was just going to be the six switches, and the basic volume and tone that Brian always uses. I was going to use a six-pole switch so you could chose which set of pickups went through to the standard (switching) set-up. It was Nigel Knight (designer of the BM Deacy Replica amp as featured in the August 2001 issue) who suggested putting another line of switches - small toggles - in for the 12-string. "They're not glaringly obvious, but they're the same switching arrangement (the toggles are sited just above the three six-string pickups - Ed). Also, the existing tone is the 12-string volume, although we did swap those around as Brian instantly went for back volume when he played the 12. It's a bit of an ongoing thing, as I might rewire the 12-string so the pickups are in parallel rather than series for a lighter sound." Are the pickups any different? "They're made by Adrian Turner at Adeson Pickups, but haven't been specially wound for the 12-string. They're full-on replicas of the sixties [Burns] TriSonics and are of a fabulous quality; he's gone to the nth degree." We also had the quickest of chats with Brian, who simply told us: "It's a magnificent job, a fantasy…"